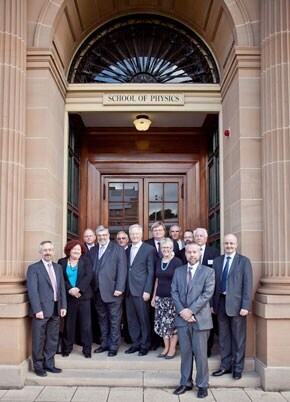 CUDOS - the Centre for Ultrahigh bandwidth Devices for Optical Systems - was officially launched on 6 April 2011 by Senator Kim Carr, the federal Minister for Innovation, Industry, Science and Research, at an event held in the MacLaurin Hall at the University of Sydney. Receiving $23.8 million under the most recent ARC Centres of Excellence funding round, CUDOS will undertake a new and expanded research program, with an extended list of partners. CUDOS was initially funded from 2003 to 2010, with this further funding for the new centre to cover the period from 2011 to 2017. CUDOS was officially launched on 6 April 2011. Professor Ben Eggleton, Director of CUDOS, is in foreground, with front row (l-r): Professor Trevor Hambley, Dean of Science; Professor Margaret Sheil, CEO of the ARC; Senator Kim Carr, federal Minister for Innovation, Industry, Science and Research; Professor Stephen Garton, Acting VC and Provost; Professor Jill Trewhella, DVC (Research); Dr Greg Clark, Chairman of CUDOS Advisory Board; and Professor Clive Baldock, Head of School of Physics. The Centre conducts research in optical physics and electrical and electronic engineering, building on its achievements of demonstrating that an integrated photonic-based signal processing platform - a photonic chip - can switch data at speeds beyond terabits a second. The new CUDOS will also extend into the area of nanophotonics focusing on metamaterials and plasmonics, with the aim of developing miniature devices that rely on optical characteristics to operate, which are unattainable with bulk materials. Professor Ben Eggleton, Director of CUDOS and based in the School of Physics at the University of Sydney, hosted Senator Kim Carr, Professor Margaret Sheil - CEO of the Australian Research Council, and a delegation of CUDOS Advisory Board members and University of Sydney executive staff on a tour of the CUDOS labs. Senator Kim Carr was able to meet some of the staff and students within CUDOS and find out more about their research. "It's a tremendous pleasure to mark this new era of CUDOS. This publically funded research centre conducts game-changing research and repays the investment that the Australian people make into it in spades," said Senator Carr at the launch. 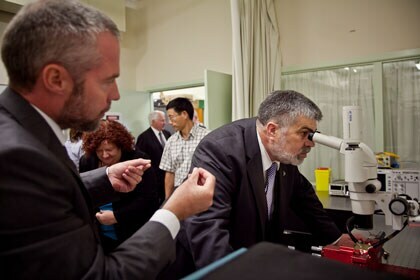 Professor Ben Eggleton, Director of CUDOS, shows Senator Kim Carr, federal Minister for Innovation, Industry, Science and Research, the CUDOS laboratories. "As the NBN fibre is rolled out to more and more homes, the traffic on the core of the network will rise. New technology being developed by CUDOS to increase the core network capacity will help ensure home users can get one Gigabyte per second - ten Gigabytes per second or more in the future as their need grows," said Senator Carr. The Innovation Minister said there are many other uses for the technological spin-offs of the research work undertaken by CUDOS. "CUDOS is generating and processing new wavelengths of laser light for sensing chemical signatures which can detect explosive material or chemicals potentially used in a terrorist threat, environmental pollutants or disease," Senator Carr said. "This has enormous implications for the nation's border security in areas like Customs and Quarantine. The technology being developed will also help to maintain our envied reputation for providing clean, green, disease-free products and, importantly, will help to ensure that exotic diseases do not become established in Australia." At the launch, Professor Stephen Garton, Acting Vice Chancellor and Provost of the University of Sydney, acknowledged and recognised the outstanding achievements of CUDOS from 2003 and noted that the Centre contributed to Australian research remaining internationally competitive. 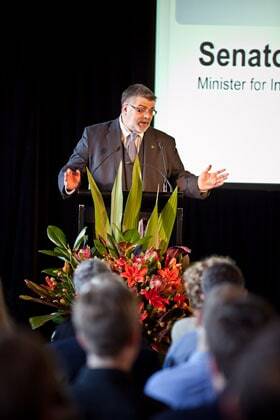 Senator Kim Carr, federal Minister for Innovation, Industry, Science and Research, officially launched CUDOS on 6 April 2011. "CUDOS is a visionary research centre. I'm very proud to help celebrate this research. The success of CUDOS relies on its collaborative partnerships - each institution involved contributes their own excellent researchers and facilities," said Professor Garton. "I applaud the federal government for supporting long term research groups such as CUDOS. CUDOS will have a long term impact on society, and build significant partnerships with industry and create spin-off businesses," said Professor Garton. Dr Greg Clark, Chairman of the CUDOS Advisory Board, spoke at the launch about the opportunity centres such as CUDOS offer to the Australian economy, by allowing our economy to broaden beyond resources and services, to provide a stable long-term economic base for Australia. "Photonics is primed to be such an area. There is the opportunity for industry to serve Australia's economy by investing in scientific research. There is nothing to stop Australia becoming a world centre for scientific research and to have an economy based on that," said Dr Clark. "This work at CUDOS is breakthrough science. CUDOS is a good building block for a strong Australian economy based on science." Professor Ben Eggleton, Director of CUDOS, thanked the CUDOS Advisory Board and acknowledged the support of the federal government, the Australian Research Council, the collaborating universities and the NSW government. "The new CUDOS has a revolutionary new program of research. Photonics crosses into many areas, including astronomy, biology, medicine, information systems and security," said Professor Eggleton. "Our research has been at the frontier of this work, but these breakthroughs are just the beginning. Our future success lies in our collaborations, our vision, our cross-platform research and our talented researchers and students. 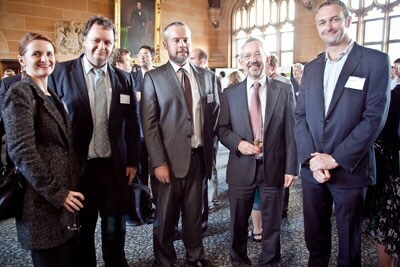 At the CUDOS launch (l-r): Christina Newman, from the Office of NSW Chief Scientist & Scientific Engineer; Dr Chris Armstrong, Acting Director of the NSW Office for Science and Medical Research; Professor Ben Eggleton, Director of CUDOS; Professor Trevor Hambley, Dean of Science; and Peter Leihn, Director of the Office of the NSW Chief Scientist & Scientific Engineer. "Central to our new program of research is our extension into the field of metamaterials, which have optical properties not found in nature. Fabrication of these metamaterials has only become possible in the past few years, through the development of nanomanufacturing," explained Professor Eggleton. "We're very proud of our students who come through CUDOS. They go into the world to do amazing things - some have started companies, gone into industry or gone into research." CUDOS is a collaboration between Australia's leading universities with photonic research programs: University of Sydney, Australian National University, Macquarie University, Swinburne University of Technology, RMIT University, Monash University and University of Technology Sydney, plus partner investigators from the world's leaders in photonic research, both globally and locally.